I have been dying to play this game. 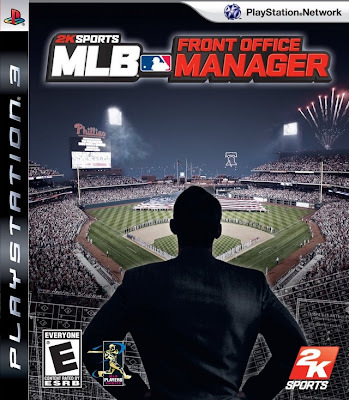 MLB Front Office Manager offers the player the chance to control every function that a real MLB GM does (with the exception of dealing with shareholders and politicians as Mike puts it). The guys at River Ave Blues give us a great review of the game and its features. It is much more important for me to hear about the game from a baseball guy rather than a video game guy. The baseball guy doesn't care if the interface could be a little smoother, as long as you get to make trades with Billy Beane. I am buying it very soon. Before the 2008 season outfielder Ryan Ludwick was known to be a powerful hitter that had probably missed whatever chance he had to be a major league regular. Then the St. Louis Cardinals actually needed him enough to give him an extended series of at-bats. He carried the Cardinals offense the entire season. This year no one questions that Ludwick belongs in the Major Leagues and the Cardinals need to figure out how to work top prospect into the mix with Ludwick, Colby Rasmus, Rick Ankiel, Brian Barton, Chris Duncan, Joe Mather, and Skip Schumaker. Russell Branyan is a similar player. Great power but too high a strikeout rate to win a regular job at this point in his career. In 2008, Branyan hit 12 homers in 132 at-bats. And he has essentially always performed that way. Last month, the Seattle Mariners signed him to a one-year guaranteed contract approaching a million bucks a year to be their primary first baseman. This was an excellent move. Branyan has a low contact rate but has a career fly ball rate over 50 percent and approaching 60 percent the last few seasons. This translates into homeruns because of his excellent career HR/FB of 21.9 percent. Do the math – (500 at-bats)*(70 percent contact rate)*(50 percent fly ball rate)*(22 percent HR/FB) = 38 homeruns. Branyan's best-case batting average is probably no better than .270 and reality suggests an average closer to .250, but if Ludwick can hit .290, anything can happen. Eventually, Bryan LaHair will eventually present Branyan with a challenge for the position but almost no one expects that to happen in 2009. Chris Shelton has also been brought in as a platoon partner for Branyan. This is a good development. Less at at-bats against lefties against whom Branyan has hit .204 during his career gives Branyan better odds at a fantasy tolerable batting average. He should be owned in every AL-only and the deeper ,mixed leagues. It feels like I haven't slept in weeks. That may be because I rarely seem to sleep more than a couple of hours at a time. I've been sick (I just read that honey is better than cough syrup - not surprising) and for the past week added a aching back to my problems but I'm sure you don't give a damn about that. The big news around baseball right now seems to be Joe Torre's new book, "The Yankee Years" which was actually written by Sports Illustrated's Tom Verducci. The book supposedly exposes lots of juicy gossip and jealousies. But the major story points picked up by the New York Post were based around Torre supposedly trashing Alex Rodriguez and Brian Cashman. There are no direct quotes of Torre doing this in the book according to recent articles. Bronx Banter picks up most of the links if you want to follow the story. My Twitter Buddy and RotoExperts boss, RotoTommy is asking for the biggest fantasy baseball disappointment predictions. I'm going with Brad Lidge who has had some serious bouts with disaster the last few years. If you are like me and can't afford to subscribe to those big prospect sites you are in luck. Keith Law has been prospect crazy lately and has put together all sorts of great lists. He has a ranking of the Top 10 Farm Systems. The Rangers come out on top and I'm not surprised. If you are an insider you can see how he ranks all of the teams. You would think that with the amount of advertising on ESPN.com that they would make the content free. Law also has prospect rankings by teams this week. It could be that the guys at Chop-N-Change (MVN's Braves Blog) are onto something with their placement of Brian Cashman in the second tier of General Managers in their article : Best GMs in baseball? If Cashman were truly taking advantage of all his resources the Yankees would have one of the top ten farm systems and Keith Law would have given us a complete top ten list. Fortunately it seems to be prospect season. Baseball-Intellect has posted their top 15 Yankees Prospects - albeit in two parts. Part One: 6-15, and Part Two: 1-5. I love that they place my favorite Yankees prospect at number two on their list, which has not happened on any other list that I've seen. River Ave Blues profiles that same prospect. His name is Dellin Betances and he dominated with a 10.59 K9 in the second half of last season. Though Rich Lederer of Baseball Analysts has an article suggesting that K per 100 pitches may be a far more relevant statistic. Is this too much Yankees talk? If you're a Yankees hater you may enjoy this article by Bert Blyleven that suggests the Yankees are an incomplete team despite their heavy spending this off-season. Alan Horne who turned himself into a prospect a couple of years ago is looking to make a comeback from a tear in his rotator cuff. Horne couldn’t throw for three months following the surgery, but since resuming his workouts in early December, he has had no complaints. It was a struggle for Horne last season, starting off by losing three of five decisions in the International League, then dropping his only decision in three starts in Tampa. For the year, Horne was 2-4 with an 8.77 ERA, a far cry from his 2007 success. In retrospect, Horne said it’s obvious why the struggles were so great. “(The injury) was a big struggle for me,” he said. “It wasn’t a huge pain, it was just pretty uncomfortable. My arm wasn’t working like it was supposed to work and it just wasn’t allowing me to extend a long way. Speaking of New York general managers. Steve Phillips is joining Sunday Night Baseball on ESPN this coming season. I know its an unpopular feeling among sabermetrically inclined baseball fans, but I actually like listening to Jim Miller and Joe Morgan. Yes, I cringe sometimes but they are fairly entertaining if you can get around that. Having more studio time from Peter Gammons is good for me too. There is a new version of Ad-Aware available. A really cool free option for fighting spyware. Do you love web comics? I do and one of my favorite artists has a new one out. The Flobots. My friend's father trashes Obama. Peter David opines. Joe Posnanski picks the most Iconic songs of the Rock 'n Roll Era. And gets a lot of it wrong! But here's the latest Hot Stove Junkie. This is the first part of a series of articles that will go position by position and league by league into the depth charts of every team. The Orioles did not sign Gregg Zaun to become their starting catcher. They signed him to serve as a mentor and potential insurance policy for top catching prospect Matt Wieters. The Orioles are publicizing Zaun as the starter because the Orioles want Wieters to grab the job rather than have it handed to him. If Wieters fails to win the job in Spring Training he will go down to the minors but expect it to be a brief stay unless he really struggles. Zaun batted .237/.340/.359 with 6 homers and 30 RBIs in 86 games with Toronto last season. In a poetic baseball twist, Zaun returns to the organization that raised him to finish his career. The Future: Matt Wieters is the future and the future is now for the Orioles at catcher. Although he is often compared to Mike Piazza with the bat, he has a far superior glove and arm. If all goes as planned (never a guarantee, even with someone this good) Wieters will be the Orioles catcher for at least the next six or seven years. There is still a strong possibility that Jason Varitek (the Red Sox Captain) returns for another season. Boston would love to acquire a young catcher like Jarrod Saltalamaccia (Rangers) or Miguel Montero (Diamondbacks) but so far, they have not been willing to meet the asking price of their respective teams. Until further notice, Josh Bard is the starting catcher. Bard has a career .318 wOBA, which is not the end of the world for a catcher. Bard draws a few walks and has a strong contact rate. His BABIP was just .230 in 2008 which when compared to his career mark of .296 indicates that his .202 batting average was mostly bad luck. He should bat somewhere around his career slash of .265/.333/.395 but batting in the Red Sox lineup should leave him with more run production opportunities than a line like that would usually warrant. The Future: The player that will eventually fill the role of Red Sox catcher of the future probably is not in the organization yet. George Kottaras will serve as the Red Sox reserve catcher until the Red Sox find someone to knock Bard down a notch. Kottaras is a fair offensive catcher. He draws walks and has a little pop but strikes out too often. Mark Wagner has shown the potential to be the next Red Sox catcher. He appeared to be a future fantasy stud by hitting for both power and batting average until he hit a wall at Double-A in 2008, the Red Sox are hoping it was just bad luck as a result of his .256 BABIP. A.J. Pierzynski does not get much respect as a fantasy option. He will receive around 500 at-bats, hit for a decent batting average in the .280-.290 range. You can expect 15-20 homeruns and a fair number of runs and RBI. Maybe the fact that he has few friends in real baseball has trickled into fantasy owner’s mind. He is on the perfect team with a manager like Ozzie Guillen, who keeps most of the negative attention on himself. Those that know this already are okay with drafting Pierzynski late or buying him cheap. The Future: Ozzie Guillen almost forced general manager Kenny Williams to trade pitcher Javier Vazquez by questioning the right-hander’s heart. A key part of the return in the trade with the Atlanta Braves was Arizona Fall League standout, Tyler Flowers. In the minors Flowers has hit for both average and power but in the 2008 Arizona Fall League his power exploded even further with 12 homeruns in 75 at-bats. A.J. Pierzynski is signed very reasonably through the 2010 season and that perfectly coincides with Flowers’ development schedule were he to spend most of a season in Double-A and most of another season in Triple-A. Victor Martinez could be playing for his next contract this season. The slugging catcher signed through the 2009 season, was a non-factor due to injuries in 2008. The Indians hold a 2010 option for $7 million that Martinez will have to earn. When right, Martinez is a fantasy stud at the catcher position. He bats for average and power. However, catcher is a position where the Tribe has options. 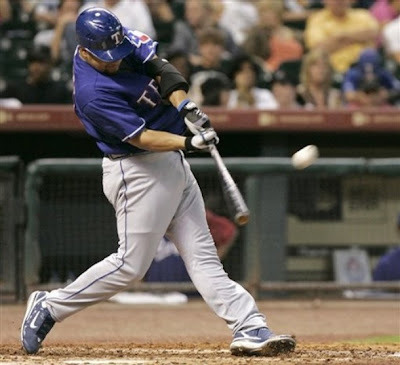 Kelly Shoppach filled in admirably for Martinez in 2008 by blasting 21 homers in 352 at-bats. Shoppach figures to receive between 350-400 at-bats by frequently pushing Martinez to first base and first baseman Ryan Garko to the bench or the outfield. The Future: His acquisition from the Los Angeles Dodgers in exchange for third baseman Casey Blake was a surprise. However, Carlos Santana has become the catcher of the future. Santana looks a lot like Victor Martinez with the bat, hitting for both average and power. He still has to prove himself at the higher levels of the minors but his development timeline has him in the majors just as Martinez’s contract runs out after the 2010 season. The trade for Gerald Laird cleared up the immediate future at catcher for the Tigers. Laird possesses great potential. However, he has also been very inconsistent with the bat. Laird’s BABIP has been all over the place --.344, .288, .250, .357, .278, and .324. He was trending upward in fly ball percentage until it took a sudden drop in 2008. It is by no means certain that hitting flyballs would help much given his very low career HR/FB rate of just six percent. The offensive peak for catchers is different from most position players and Laird is entering that peak but predicting what the real Laird is capable of doing is next to impossible. Matt Treanor, formerly of the Florida Marlins, becomes the new back-up catcher. Treanor has no offensive potential and thus zero fantasy value. If Brandon Inge makes more than a token appearance as a catcher, everything will have gone wrong for the Tigers. The Future: Defensively, Dusty Ryan was ready to join the Detroit Tigers the day he was drafted. Unfortunately, the Merced College product needed a few years to get his bat major league ready. However, if we can judge by his 2008 season he’ll be there soon. 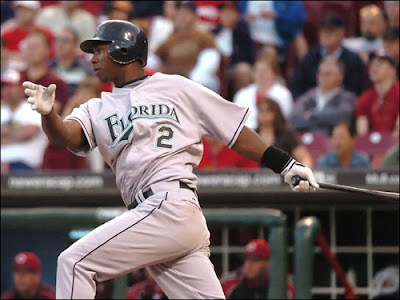 In 2008, he had a .363 wOBA at Double-A in 296 at-bats. He was promoted to Triple-A, where he posted a .397 wOBA in 73 at-bats. He capped his best offensive season by excelling in a Major League cup of coffee where he achieved an impressive .380 wOBA albeit in just 44 at-bats. 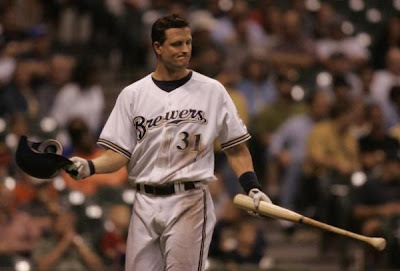 He will have a shot in Spring Training but unless Laird truly struggles, Ryan will return to the minors for most of 2009. Further off, Alex Avila has a bat a fantasy owner can appreciate but could be changing positions before he gets a chance to help. This is by far the worst catching tandem in the American League. Miguel Olivo has a little pop but is such a disaster at the plate that it is rare anyone notices. How horrible must Olivo be? When a .255 batting average is the second highest mark of his career? A good batting average is hard to come by with a 66.8 contact percentage. John Buck has failed to be a better option. Buck has better power than Olivo, and draws more walks (not that many more) and has a slightly better contact rate of 75.2 percent. Despite better skills he has failed to fight off Olivo for the starting job. Both will get their share of at-bats but neither is worth rostering. The Future: Any catcher in the Royals system that has any chance at a major league career is either an older veteran like Vance Wilson or a failed prospect like Brayan Pena or J.R. House. Vance Wilson never could hit and after Tommy John surgery, his throwing has to be a huge question mark too. Pena at least makes excellent contact and has a good glove. That gives him the best chance of providing quality for the Royals at catcher. Jeff Mathis is probably a better defensive option than Mike Napoli is. However, Napoli is so much the better offensive option that it is difficult to imagine Mathis matching even the 94 games he played in 2008. According to fangraghs.com measurements, Napoli was not only the more valuable catcher but also the most valuable player on the Angels. Napoli had a wOBA of .399 (in 227 at-bats). Mathis posted a pathetic .260 wOBA in 2008 and has just a .261 wOBA for his career. ‘Nuff said. The Future: Napoli is just 27 years old and under the Angels control for another four seasons. Napoli is the present for the Angels and likely the future. Ryan Budde is an okay option if an emergency pops up for the Angels but you do not want him on your fantasy team. Bobby Wilson could also make things interesting in the next year or two. He has not had a wOBA below .342 in the minors and little to prove at Triple-A. Hank Conger has potential but needs to work on his plate discipline and staying healthy. Joe Mauer is the best catcher in the Major Leagues. As long as his knees stay healthy and the Twins cough up the bucks, he should be behind the plate in Minnesota for another decade. Mauer is a fantastic hitter who annually puts up .300-plus batting averages and steals a few bases. He could still develop some power but at this point, it does not matter anymore. He is the best in the business just as he is. Mike Redmond is not in Mauer’s class as a hitter but he does a fair job hitting for average. In AL-only leagues, Redmond is a better option than players like John Buck. The Future: When you start at Joe Mauer, the Twins system seems barren of anyone who could even tie his shoes in the majors. Wilson Ramos is beginning to show some nice power in the minors. He still needs to develop a little plate discipline but he has better offensive potential than most catchers do. If the Yankees could count on Jorge Posada being healthy, they would not need such a long list of secondary options. Posada provides great power and a decent to good batting average…when healthy. Because he had major shoulder surgery last season there are some who suggest the Yankees sign a more serious second catcher like Ivan Rodriguez or even Jason Varitek. But the Yankees are betting that Posada will be back to full strength at some point this season if not to start the season. Most reports suggest that he will not be ready when Spring Training begins, but should be available for the season opener. Jose Molina will receive the bulk of the at-bats when Posada is unavailable. Molina has almost zero fantasy value as a hitter. It would be zero were he not in the loaded Yankee lineup. Kevin Cash, because of his major league experience, has the best chance of backing up Molina if Posada is placed on the disabled list. Cash is just as worthless with a bat in his hand as Molina. The Future: In very limited at-bats, Francisco Cervelli has shown skills at the plate (.386 in 73 Double-A at-bats. He draws walks and hits for a decent batting average. He does not have much power but any hitting skills from a catcher are worth noting. He does not appear to be suffering any ill effects from the Spring Training accident that broke his wrist. I find it interesting that the Yankees called on Cervelli rather than Jesus Montero (.388 wOBA in 2008) when they needed a catcher considering Montero’s greater experience. Cervelli is probably superior behind the plate, but still needs to complete an entire season. The Yankees’ Austin Romine may be the best overall catcher of the bunch. In his first (almost) full season, Romine finished with a .355 wOBA in 407 at-bats. He displayed excellent contact skills and homerun power. Kurt Suzuki has very little power but rarely strikeouts and knows how to draw the occasional walk. There have been rumors that Suzuki has the speed to steal bases. The Oakland Athletics typically neglect to utilize base-stealing skills. Suzuki will provide you with a decent batting average, a few homeruns, and a couple of stolen bases. He is no Russell Martin but he is better than many of the alternatives. Rob Bowen is the back-up catcher. Bowen takes walks but strikes out at an absurd pace that renders him nearly useless for fantasy purposes. The Future: Kurt Suzuki is only 25-years old and not yet arbitration eligible. However, the Athletics have a habit of dumping players before they become expensive provided they have a capable (and cheap) replacement. The A’s signed Joel Galarraga out of the Mexican Summer League. He’s a giant question mark at this point. John Donaldson projects to be a fantasy worthy catcher but his defensive skills (or lack thereof) may force him to another position. Petey Paramore (you have to love the name) draws walks but seems to lack any other skills with the bat. He does have the glove to remain at catcher however. Had Jack Zduriencik been the general manager a year ago, chances are the Mariners would never have signed Kenji Johjima to a new three-year contract. However, he was not and the contract was signed thereby blocking the less expensive and better hitting option, Jeff Clement. This season the pair will split the catching duties almost equally with Clement also collecting at-bats as the designated hitter and occasional first baseman. Johjima is a better hitter than he appeared to be last season. He has the ability to hit for average and power and rarely strikes out. Unfortunately, he will be losing at-bats this season to Clement, which will dramatically reduce his usefulness to fantasy owners. Jeff Clement has excellent contact skills, draws walks, and hits for power. He is exactly the type of fantasy option the catcher position needs. The Future: Somehow or another, the Mariners will find a way to install Jeff Clement as the full-time catcher. The Boston Red Sox would be an excellent option for them considering Boston’s bountiful farm system and need for a major league catcher. Dioner Navarro is an excellent contact hitter and knows how to draw a walk when necessary. He has no power worth mentioning. Shawn Riggans is presently the back-up catcher but will have to fight to keep that role in Spring Training. Riggans is a lousy hitter with a little power. Navarro is a fine catcher and could probably be signed rather inexpensively through his arbitration years. However, the Rays like their future options. The Future: John Jaso is going to be a fantasy worthy catcher. He has plate discipline, draws walks, makes excellent contact, and has good and still improving power. He isn’t quite ready but will be allowed to battle Shawn Riggans for the reserve role during Spring Training. The most likely scenario has Jaso spending another year in the minors before emerging during the 2010 season. The Rangers have a better collection of catchers than any other team even after trading Gerald Laird. All three catchers will do battle in Spring Training for the starting catcher’s role. Jarrod Saltalamacchia was the key piece in the Mark Teixeira trade. Salty is the most likely starter this season after an impressive winter ball performance. He should hit for both a decent average and power. He should develop into an excellent fantasy option but still needs to improve his plate discipline. Taylor Teagarden is probably the best defensive option of the three. Teagarden has excellent power but the rest of his hitting skills are still developing. Max Ramirez has the worst glove of the three but is a monster with a bat in his hands. He is easily the best bat of the bunch but may be moved to another position to fit into the Ranger lineup. The Future: Everyone seems to be waiting for the Rangers to make a decision about their catching. The Rangers are in no rush to decide. For now, the most likely scenario is for Saltalamacchia to start in the majors with Taylor Teagarden and Max Ramirez both returning to the minors. But if any or all of the three prove ready for the majors, the Rangers will not hesitate to find a way to fit them all into the major league lineup. Rod Barajas will start behind the plate for the Blue Jays. Barajas possesses power but very little plate discipline. 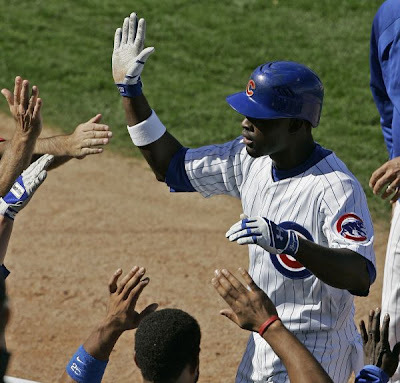 The Blue Jays brought in veteran Michael Barrett to compete for a job. Barrett was once a top fantasy catcher but injuries and ineffectiveness have ruined the last few seasons for him. Barrett is apparently healthy now and if he has retained the skills he showed a few years ago he is easily the best fantasy option on the team and worth a small gamble. Curtis Thigpen has no chance of starting for the Blue Jays. However, he will compete for the reserve role. Thigpen has none of the hitting skills that might make him fantasy worthy. The Future: J.P. Arencibia is the catcher of the future. He has steadily improved his defense and displayed power with the bat. Arencibia’s lack of plate discipline is his greatest weakness. But by hitting 27 homeruns between two levels he has placed himself firmly into the fantasy baseball landscape. Brian Jeroloman could work himself into the picture as well. He draws walks like a veteran but lacks power, which limits his upside. Emily Stecher needs our help one more time. Help her out and you could win a $50 Visa Gift card. Thank you so much for participating in my first survey. The results raised more questions than I could have imagined. I have condensed those questions into a few very important ones and I am hoping that you all can take a few minutes to fill out this follow up survey. The survey will take approximately 5-10 minutes to complete. Please follow the instructions and answer all of the questions to the best of your ability. Do not consult any outside sources. All responses will remain completely anonymous and will only be used for the purposes of this study. Please finish the whole survey in one sitting as you will not be allowed to re-enter the survey to update or change your responses. All participants will be eligible to win a additional $50 Visa Gift Card upon completion of the survey. On January 20th I will be drawing two names of people who have completed both surveys. At the end of this survey, please be sure to leave your e-mail address. Your e-mail address will not be linked to your responses to ensure anonymity.